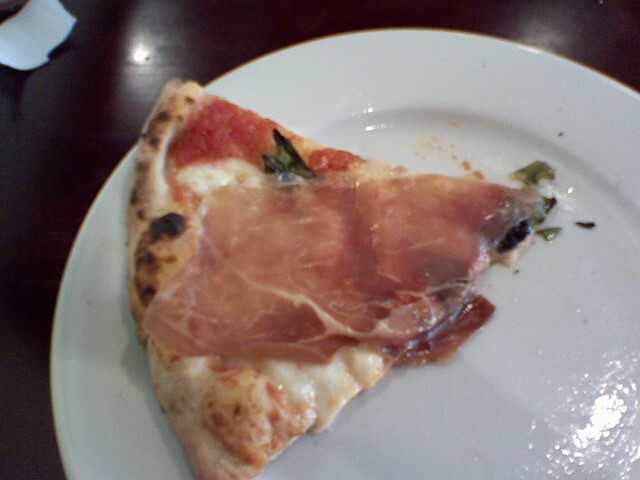 Another Salt Lake City that kept popping up on “best-of” lists was Settebello. 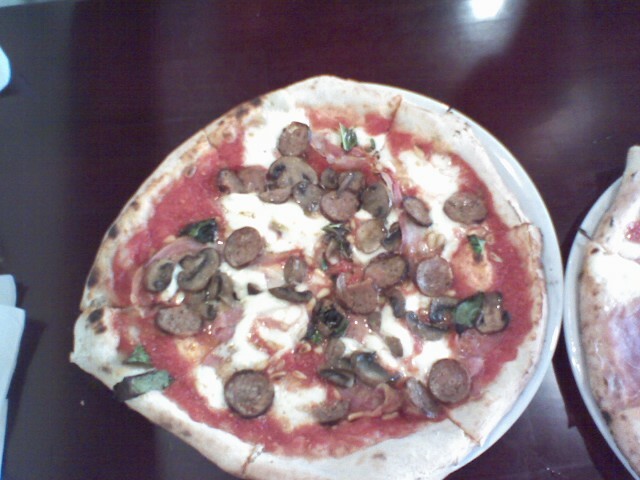 Settebello serves authentic Neapolitan-style pizza as established by the guidelines of the Verace Pizza Napoletana Association founded in Naples, Italy. In 2007 Settebello was certified by the President of the US Chapter of the VPN, Peppe Miele, as only the 16th member in the United States. Of course, all that doesn’t necessarily mean the pizza is good. Like Red Iguana, Sarah and Damon were able to vouch for Setebello’s pizza. Since they are both native East Coasters who know a good pie and have actually been to Italy, my husband and I headed there (with Damon for good measure) for lunch. We ordered two pizzas. We got a classic margherita draped with prosciutto and the house special Setebello pizza, with crushed tomatoes, pancetta, fennel sausage, roasted mushrooms, toasted pine nuts, mozzarella and basil. The ingredients were top-knotch, and the thin crust was perfectly crisp. Topped off with pistachio gelato for dessert, it was a pretty much perfect pizza experience. 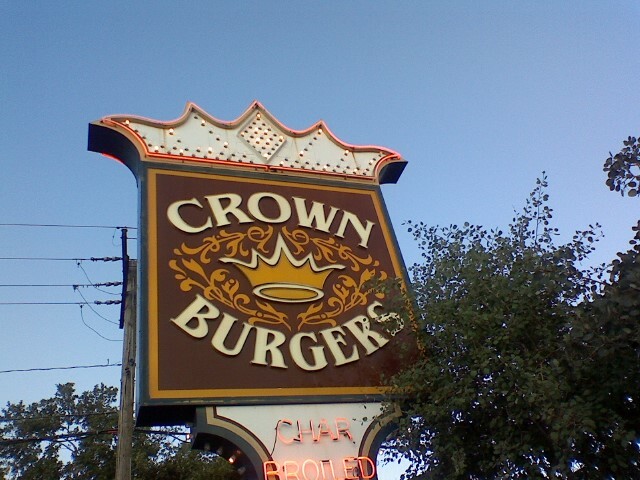 When I read about a cheeseburger topped with pastrami, I knew I had to visit a Crown Burgers location in Salt Lake City. 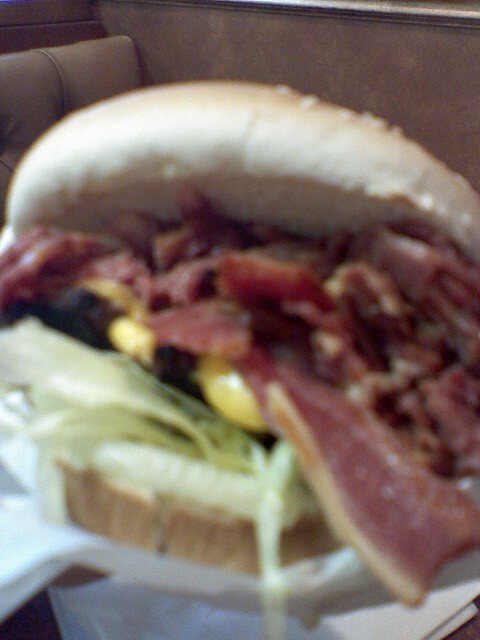 I love both cheeseburgers and pastrami and was eager to try the two together. Well, the title of this post probably gave it away, but alas, Crown Burgers’s signature sandwich didn’t live up to my expectations. I expected the saltiness of the pastrami to bring out the flavor of the beef, but the two just overwhelmed each other. I do like knowing that something as ridiculous as a pastrami cheeseburger exists in the world. Crown Burgers introduced me to another new taste. I never knew regional foods included condiments until I encountered Utah’s beloved fry sauce. To me, it was merely glorified Thousand Island dressing, but to each his own, right? 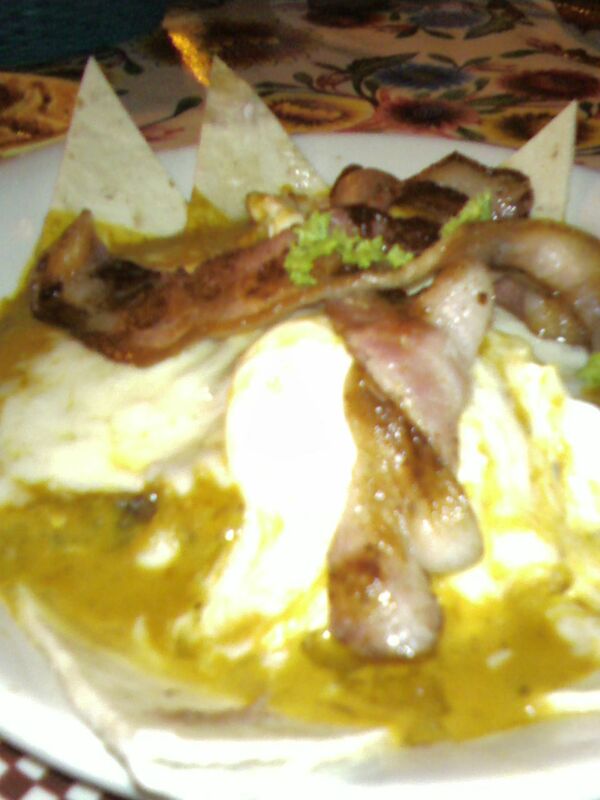 I don’t even want to think what was going on in my arteries that night. Summer vacation part 2: Holy mole! 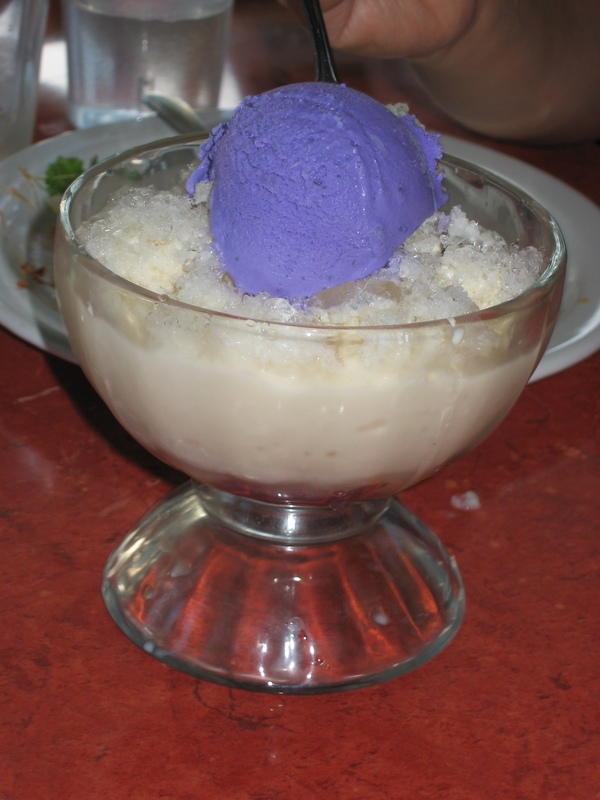 Whoa, those last two posts about Filipino food and rural America were heavy! The next several entries will be my visit to Salt Lake City, the food scene there and will be angst free. I’m one of those people who likes to do a lot of research before traveling somewhere. And much of that research involves where to find great food. 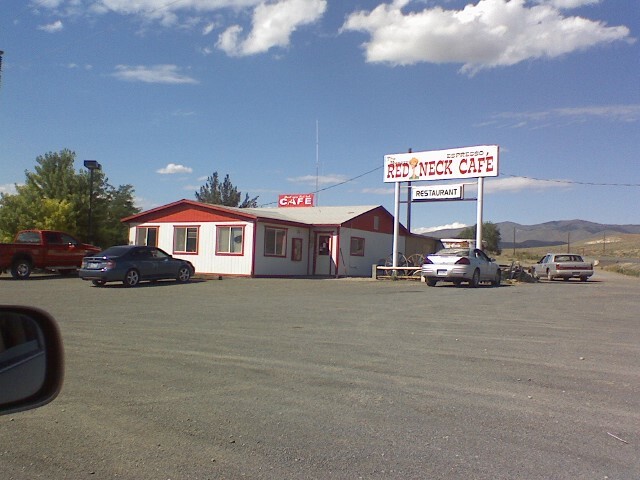 One name kept popping up as I investigated the Salt Lake City restaurant scene: Red Iguana. Red Iguana reportedly serves the best Mexican food in Salt Lake City. I was skeptical since I didn’t think many Mexicans live in SLC. Best compared to what? Azteca? (Not that I don’t enjoy Azteca. But still.) However, my friends Sarah and Damon confirmed that Red Iguana had excellent food, and we made plans to go there for Sunday brunch. One of Red Iguana’s specialties is mole, a sauce made of dried and fresh chiles, nuts, spices, herbs, fruits and vegetables. Mole is often called Mexico’s national dish. There are seven different varieties of mole on the Red Iguana menu. I had the huevos motulenos: poached eggs and carnitas with mole amarillo (made with golden raisins, yellow tomatoes, yellow zucchini, chile guajillo and dried seasonal yellow chiles). All of this was topped with big fat pieces of bacon. Every bite was delicious, and the mole amarillo had none of the cloying sweetness that I’ve experienced with other mole sauces in the past. I also sampled Sarah’s salmon chimichanga, which was one of the day’s specials. 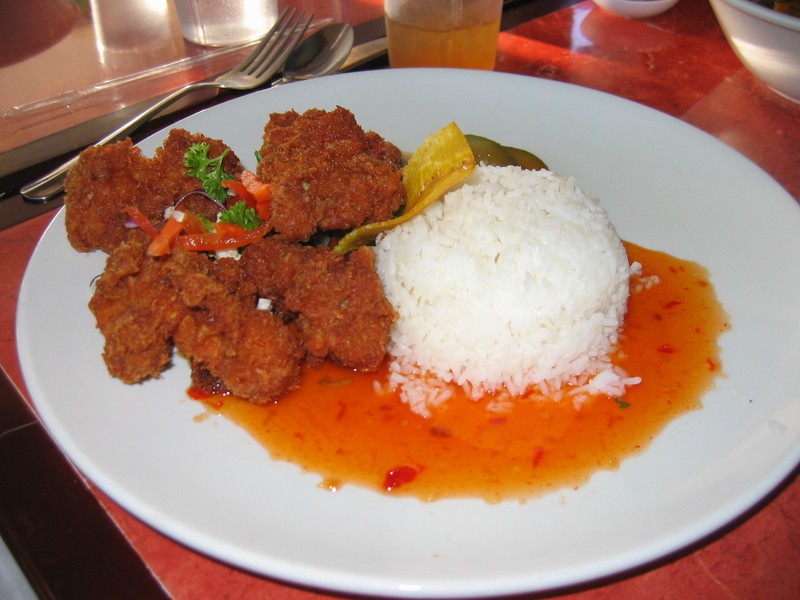 This kind of dish is served all the time in Seattle, but how would it be in a landlocked state? It was great! My husband ordered the spareribs, which I had never seen offered on any Mexican restaurant menu before. It’s good he got a huge portion because I probably ate a quarter of his meal. The spareribs were incredibly tender. 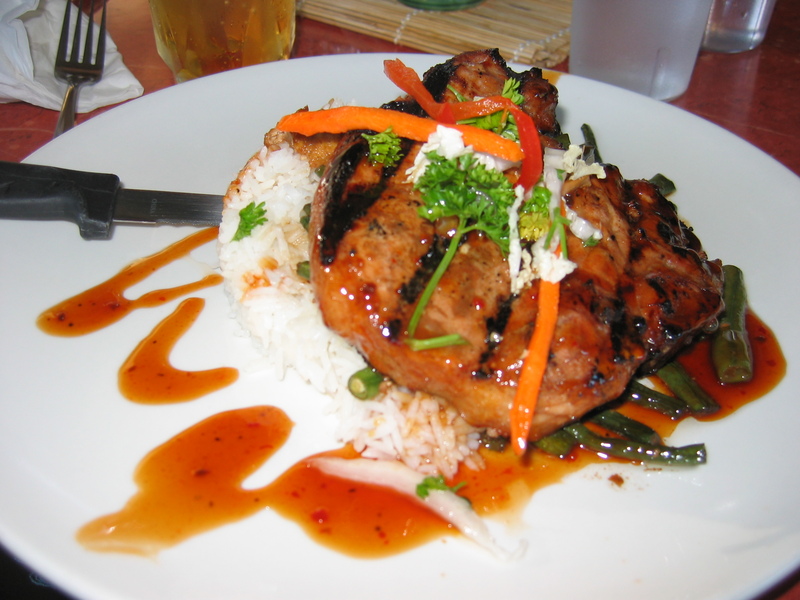 They were sneaky spicy — the heat took awhile to develop on the tongue and hit me when I least expected it. 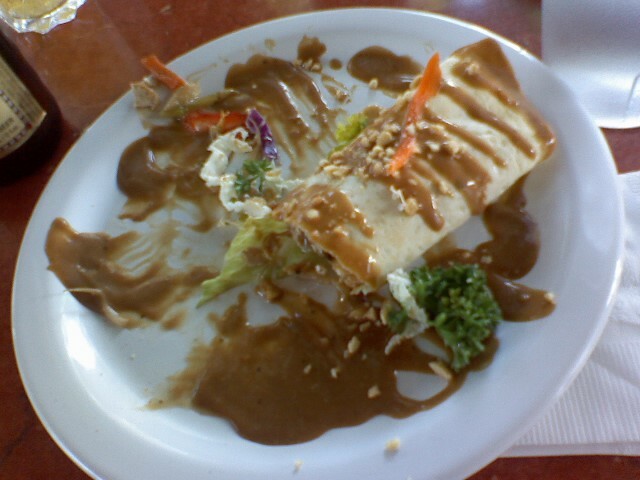 The succulent meat tucked in flour tortillas was a simple pleasure. My first taste of Salt Lake City’s culinary landscape was utterly delicious and surprising. It made me hungry for more.